Carrick died of pneumonia, at St Petersburg, on 11 November 1878. William Carrick was noted in Russia for his height, which was 6 foot and 4 inches. He had married once, to one Aleksandra Grigorievna Markelova (1832–1916), fathering by her two sons, Dmitry and Valery, whilst adopting her son Grigory from an earlier marriage. He trained Grigory as a photographer, while Valery went on to become a famous caricaturist. His wife Aleksandra, nicknamed Sashura, was a liberal and a nihilist, and for a time the only female journalist at the Peterburskie Vedomosti ("St Petersburg Times"). 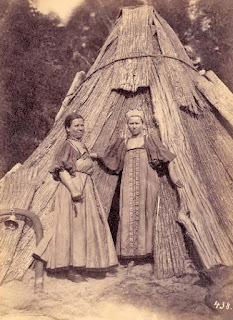 All articles on William Carrick point out, not only his royal connections, but his work photographing peasants. No doubt this was where Valery had the opportunity to learn so many Russian peasant tales. I was surprised to learn that he was part of a Scottish community in Russia. Back home in Great Britain, Valery's cousin, Oxford professor of Russian and Other Slavonic Languages, Nevill Forbes, produced, among other publications, several elementary Russian readers and translated Valery's first three books, Picture Tales from the Russian (1913), More Russian Picture Tales (1914), and Still More Russian Picture Tales (1915). To find actual information on Valery himself, in English online information, we discover he illustrated Rose Fyleman's Widdy-Widdy-Wurkey: Nursery Rhymes from Many Lands, published in England in 1934, then re-published as Picture Rhymes from Foreign Lands, in the U.S. in 1935, and later (1971) as Nursery Rhymes from Many Lands. He's also included in No. 3 Joy Street. That and the sentence listing him as the son of William Carrick are all I could find online in English. Only Wikipedia articles originating in his adopted land of Norway and homeland of Russia tell us about him. Valery Vilyamovich Carrick (1869-1943) - Russian children's writer, journalist, illustrator and cartoonist. Son of interpreter AG Carrick and photographer of Scottish descent VA Carrick. (Lois: William is translated Vilyam and that's why what seems to be Valery's middle name is actually his patronymic, Vilyamovich, meaning Son of William.) Was a British subject, but most of his life in Russia. He studied at the Academy of Arts from 1882 to 1886. As a painter and graphic artist came to prominence during the second half of the 1890s. 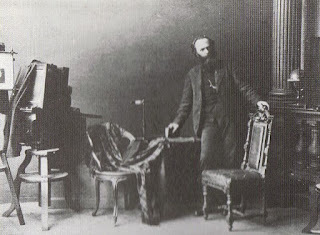 He exhibited his works at exhibitions since 1903 (Society of Russian watercolors). In 1905-1906 years worked in the satirical magazine "bogey" and "Goblin", and then was a correspondent for "Bulletin of finance." Known gallery of cartoons on the Russian writers, politicians, public figures: Gorky, Leonid Andreyev, Bryusov, Andrei Bely, V.Korolenko, A.Kuprin, S. Witte, Stolypin, V. Kokovtsoff, Miliukov , P. Struve, I. Tsereteli, F. Plevako and many others. World renown came with his caricature, "The Tsar and Tolstoy," published in the British newspaper, "Manchester Guardian" September 5, 1908 (for the cartoon, he spent ten weeks under arrest). He was engaged in the collection, writing, illustration and publishing tales of different nations of the world, especially Russian. Since 1909, Russia began to appear in his "Picture-Tales." His caricature of Maxim Gorky was in the magazine "Goblin", 1906. He made postcards at the beginning of the 20th century caricaturing bureaucracy and another 1900 card encouraged the February revolution, but he reacted negatively to the usurping of power by the Bolsheviks. In December 1917, he emigrated to Norway, he lived in a small town Valsta (Norwegian) not far from Oslo. He actively participated in the life of the Russian diaspora and worked with immigrant publications. He wrote articles with socio-political content and continued to work as a cartoonist. He was the initiator of the campaign "Help a friend" in favor of hungry people in Russia. In 1920, at the request of Gorky, he was involved in raising funds for Russian scientists. In 1920 he published a collection of fairy tales with his own illustrations. In 1930 - he was the author and editor of the newsletter "Contact". He also had a conversation with Russian emigrants around the world, among its recipients A.Kuprin, Rachmaninov, I. Shakhovskoy, F. Stepun Struve and many others. In 1933 and 1936, he made several trips to Europe to collect folklore and reading the lecture series "Life stories". He was buried in the cemetery in Asker. Carrick Valery V. (William Vilyamovich) 19 (11?) November 1869 (St. Petersburg) - February 27, 1943 (Valsta, Norway). Cartoonist, book illustrator and writer. Son of St. Petersburg photographer and watercolorist William (Basil) A. Carrick (1827-1878), a native of Scotland. Like his father, had British citizenship, but considered himself a Russian. He graduated from the Teachers' Institute in St. Petersburg. He studied at the Academy of Arts in 1882-1886. Was an acquaintance of Gorky (since 1899). From 1902 published caricatures of Russian culture and cartoons on the socio-political issues in the journals "Sparks", "bogey", "goblin", "Journal of magazines", "Dragonfly", the newspaper "Russian rumor." Signed work: VK or V. C. Performed caricatures of VGKorolenko (1905), Gorky (1906), SG Wanderer (1906), DV Filosofova (1916), Merezhkovsky (1916), VV Rozanov (1916), a cartoon, "The State Duma. Freestyle imitation of Raphael "(1907). Author of the satirical cartoon watercolor postcards: "Zemsky Sobor", "The Constitution as the Constitution", etc. Postcards and cartoons of V. Carrick enjoyed great success with collectors. In 1908, for the publication of sensitive political cartoons "L. Tolstoy and Nikolai II »and« Cholera and hangin' in the British newspaper «The Manchester Guardian» (September 5, 1908) was subjected to ten-week detention in Moscow. A correspondent of "Bulletin of Finance." He was engaged in the collection and processing of literary fairy tales. Illustrated and designed children's books, among which the most famous series "Fairy Pictures" (33 issues), which was published in 1909 and reprinted many times in Russia up to 1923 (printed, usually in the printing BM Wolf in St. Petersburg and Moscow book publishing "Zadruga"), "Dictionary Assistant" (Pg. 1917), "Drawings by Ivan Krylov's fables" (Wiley, 1923), etc. In 1914, his book of fairy tales, translated into English ("More Russian Picture Tales "), was published in the United States. He took part in the exhibitions: «Blanc et Noir» (1903), the Society of Russian watercolors (1903), drawings and prints in the halls of the IAH (1915, 1916). Read the report "illustration" at the 1st All-Russian Congress on Family Education (1914). Since December 1917, with his wife Olga Mikhailovna, lived in Norway - first in Halingdal (Hallingdal), then Brandbu. Later the couple settled in the small town of Valsta (Valstad) near Oslo. Actively participated in the life of the Russian Diaspora, worked with immigrant publications. Wrote articles with socio-political content in the newspaper "Rudder" (Berlin) and "Revival" (Paris), continued to work as a cartoonist. Member of the Russian emigre circles (1927-1931), one of the organizers of the first Days of Russian Culture in Norway. The initiator of the campaign "Help a friend" in favor of hungry people in Russia. At the request of M. Gorky was involved in raising funds for Russian scientists. In 1933-1936 - the author and editor of the newsletter "Contact". 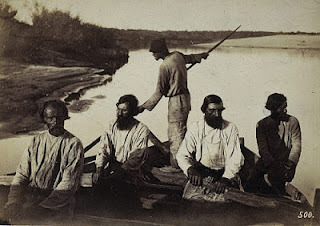 Corresponded with Russian emigrants around the world, among its recipients were AIKuprin, Sergei Rachmaninoff, FA Stepun Struve, John Shakhovskoy etc. Produced the 12 caricatures of the leaders I and II State Dumas and Ministers of the Russian Empire for a book by the English historian B. Peyrsa «Russian memoirs» and illustrations for the book "Puss in Boots" for the Paris edition Siyalskoy E. (1930). In the early 1920s, prepared new editions of "Tales-images" with his own illustrations ("Snow Maiden", "Gingerbread Man," "Little Red Riding Hood," "Straw bull", etc. ), the circulation of which was distributed by countries of the Russian diaspora. With a series of lectures, "Life stories" for Russian emigrants made tours to cities in France and the United Kingdom (1932), Germany and Switzerland (1933), Finland and the Baltic States (1936). Continued to produce on a rotator (Lois: mimeograph?) cheap black-and-white books for children. Buried at the cemetery in Asker (Norway). Ink drawings and watercolors from the collection of director of publishing house "Knowledge" KP Pyatnitskiy stored in the Archives of Gorky in Moscow. Bibliography:* XH USSR 4/2/273; HRZ.VV Rozanov Among the artists. St. Petersburg., 1914. S. 419-420.Shaposhnikov F. History of a cartoon / / Spark. 1958. Number 17. S. 19.Leonid Andreyev and Gorky: Unpublished correspondence. Moscow, 1965. S. 611 (op.cit.) (Letter inheritance. T. 72. )Boris Grigoriev Funny portraits of writers / / Evening Leningrad. 1969. July 1 (№ 152). C. 3.Diveev M. Funny portraits / / Evening Leningrad. 1976. Sep 16. (№ 219). C. 3.Caricatures William Carrick / / Neutral: Portraits, sketches, historical narratives and essays. Voronezh, 1973. S. 180-181 (from Portree.) Silt. Valery Carrick (born 1869, died 27 February 1943) was a Norwegian / Russian illustrator, draftsman and translator. Carrick was born in St.Petersburg, Russia, but had Scottish citizenship when his ancestors came from Scotland. As a result of the October Revolution, Valery Carrick and his Russian wife Olga Mikhajlovna came to Norway as refugees in 1917. Their first residence was Gol in Hallingdal, then the surrounding area before settling in Nuremburg. At first they rented a small house in Holm Bay, on Hvalstad. In 1926 they moved to Kunstnerdalen and stayed in the same house as Martha and Rasmus Steinsvik had stayed in previously. Carrick freelanced in 1905 as a cartoonist in the Russian satirical journal as Zupel (sulfur] and Lesij (forest troll). During a stay in England in 1908 he produced his caricatures of authors and British politicians printed in several newspapers. In The Manchester Guardian, he printed a caricature of the czar and Leo Tolstoy which led to him being arrested and imprisoned for 10 weeks. Carrick is also known as both the reteller and illustrator of folktales. These adventures were first published in 1909 and subsequently translated and published in England, USA, Holland and Germany. Valery Carrick was also central in the effort to spread the knowledge of Russian culture in Norway. He published, including the self-printed newspaper, Svyaz '(connection, communication), as part of this work.